My Disney itch began when I was five years old and rode Space Mountain for the very first time. It became my one and only favorite attraction and I have been hooked ever since! I have had the opportunity to visit Disney many times throughout my childhood and adolescence and with each visit a new magical memory was made. 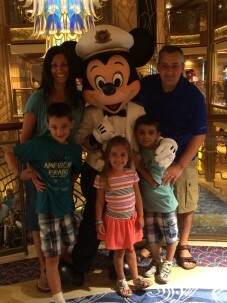 Now, as a mother of three, my trips to Disney include my kids and I love it! Every time we go back there is something new and different for them to experience. Many thought I was crazy traveling to Disney with small children at first because it was believed they wouldn’t be able to remember their vacation. Well…many years later I still cherish my Disney “first” moments! Words cannot express the joy I feel when sharing the thrill of Space Mountain, my childhood favorite ride with my children. Seeing their excitement are moments I will treasure forever! Being able to watch priceless smiles emerge on my children’s faces as their love for Disney is brought to life with each trip is truly an amazing experience! My children are always asking to go back to “Mickey’s House”, pulling out the Disney family photo album, and watching video clips of their favorite attractions from the Disney World website. Unforgettable first time memories are always made with each trip and I am so happy I am able to give them the gift of Disney! Traveling to Disney with my children has inspired me to help other families plan amazing Disney vacations filled with unforgettable moments! As my love for vacation planning continues to grow, I have decided to extend my planning services to other destination areas outside of Disney! Now, I can offer even more opportunities for families to make memories. These destinations include: Universal Studios Orlando, SeaWorld, Sandals/Beaches resorts, Carnival Cruise Line, Royal Caribbean Cruise Line, and Viking River Cruises! You want it, I can plan it!!! My goal is to work with you in order to create a customized vacation that you and your family will enjoy! Contact me anytime and together we can make all of your travel wishes come true! Connect with Mindy on Facebook!